I have been worried about security for a long time. When you read regular articles about security you will almost always face paragraph which tells you that it is very important to have a good password. Last time I tested how easy/hard it is to crack my wap2 secured wlan with weak password. I am now going to crack my macbook pro which is running OSx Mavericks. I have actually learned something in past few months and I have very strong password at the moment. For this test I changed it to something which I feel is closer to password users normally have. I changed the password to: Laisk489 . It is a Finnish word meaning lazy with little bit of leetspeak and it will pass Apples password policy. Like in router article I did not have any previous experience about cracking OSx password. So google was my friend again. 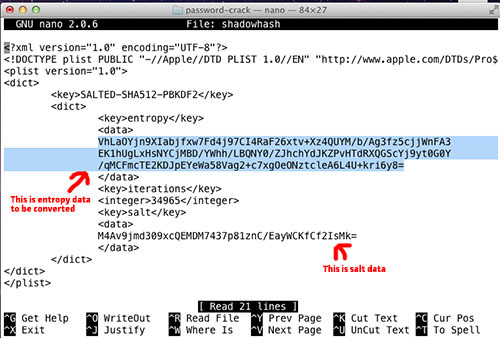 Not so many searches later I found this very decent article about “How to Extract OS X Mavericks Password Hash for Cracking With Hashcat”. It is step by step guide of what I was looking for, perfect! There is methods to obtain password hash(which is the password protected with mathematical algorithm) when you are unable to log into any account on the machine. I am not so interested about that since I just like to test how weak my own password is. So I skipped that part. After reading the article I knew that password hash in Mavericks is located in this path: /var/db/dslocal/nodes/Default/users/<user>.plist . I opened terminal on my mac and tried to acces to /var/db/dslocal/nodes/Default/users. It did not worked cause I did not have permissions to that folder. I had to sudo. Now this part goes little bit tricky and I spent couple of hours thinking what is actually happening. After all this is actually very simple task. The hash is in binary format by default and we want to convert it in to XML. And there was lots of stuff in it. Line I was looking were under “ShadowHashData” surrounded by <data></data> tags. I copied that data to a clipboard with cmd+c and pasted it to sublime texteditor. I removed returns and put everyhting on the same line. Just hitted return like hundred times and took care that any letters were not deleted. Hash were now converted. 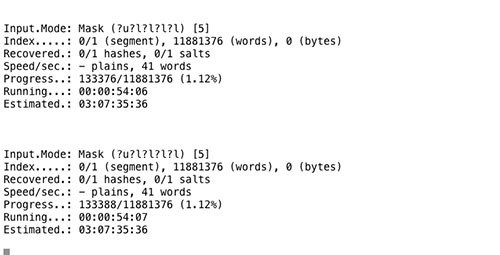 I opened shadowhash with nano editor and there was data separated under tags entropy, iterations and salt. As said in the guide entropy and salt were still in base64 format and needed to convert again. I repeated same process to the salt hash. Please notice that everything is on the same line, there is just wordwrap turned on in sublime-text! For cracking I am using my mid 2012 13″ macbook pro with 2,9GHz i7. Alright everything was prepared and ready for hashcat. At this point the guide went littlebit tricky and led to dictionary attack. It was obviously something that does not fitted my needs and I started to googling. Actually I am very happy that original guide was littlebit tricky and led me to google. 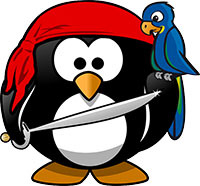 I found this particularly fine blog about all kind of goodnes: http://www.unix-ninja.com/. And there was also very nice guide about hashcat. I tought that bruteforce is something I would like to use, but unix-ninja teached me something new: brute force with masks. Basicly the mask is pattern for cracking software (hashcat in this case) which contains some facts we already know about password. For example if you know that password starts with uppercase letter, last three digits are numbers and is 8 characters long you can actually tell it to hashcat. With those kind of infos hashcat is able to crack the hash way more faster than without any foreknowledge. Now let me take a self… No not that. I needed the hashcat and I downloaded it from here: http://hashcat.net/hashcat/ It went to my downloads folder which I opened in Finder. File was compressed and I extracted it by clicking on it(with The Unarchiver). Copy pasted the hash I made earlier and saved. It contains this information about password: Starting with uppercase letter, last three characters are numbers and total of 8 characters long. More info from hashcat manual. I wanted to make sure that my hash was working. I made wordlist.txt file into hashcat directory and put there couple of words including my password Laisk489. I ran hahscats dictionary attack and it did break the hash and found that password was Laisk489. After the execution were completed I found results in the file hashcat.pot. There was my password Laisk489. Well it seems like my skills were littlebit inadequate. It was still very interesting and educational project. I might continue from this point later with new strategy and try to use modified version of wordlist which I used in router guide. I was suprised that it takes that long to break password with mask even it is not more than 8 characters. Of cource the method was still brute-force and my hardware is not that good and yes I was just using one laptop. Hard jacks might have bigger weapons. :p Which means that I am still going to use much more complex passwords than Laisk489 in the future. If the time is not a problem or password is for example just only 4 or 5 characters it might be good shot to use these methods. Haha. I mean it will still crack it lol.